Spur Gears for Printrbot (Printed Extruder) by Drawcut is licensed under the Creative Commons - Attribution - Share Alike license. This is a set of spur gears for the Printrbot extruder. The original herringbone gears of the PB are not well suited for the application, IMO. The herringbones are sensitive to misalignment and give few benefits in return. The small spur gear is made wider then the large gear to allow for axial misalignment. The hubs are taken directly from the original Printrbot STLs. Gear ratio is the same as original. I have not yet printed or tested these yet but they seem to slice OK in Slic3r 0.8.4. Solidworks files are 2011 version. Update: 05/07/12: -Deleted- See Update 3. Update 2: A PB plus user has printed and installed these with good results. 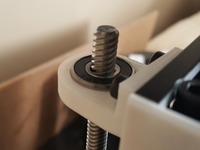 Updated 3 (06/07/12): These gears should work for any of the Printrbot printed extruders. 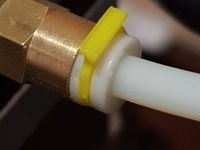 (PB original, LC and Plus) There may be some variation in some of the PB supplied parts out there but these are sized for the official released extruder. 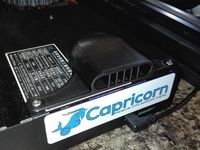 Note: Brook has mentioned a new laser cut extruder he is working on. Unknown what the gears will be on that. Updated 10/7/12: Added fixed versions of the V1 parts. Fixed by using Netfab's cloud service to get rid of the non-manifold conditions. 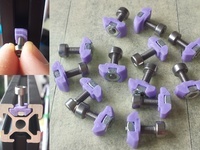 Print and assemble the same as you would for the original parts. Say thanks by giving Drawcut a tip and help them continue to share amazing Things with the Thingiverse community. We're sure Drawcut would love a Tip, but unfortunately they have not setup their accounts to receive them yet.